Bridge City Collective is your place for North Center marijuana products. Most products come in gluten-free, non-GMO, and vegan varieties. We also carry glassware, edibles, rare strains, and “boutique” flowers from our in-house farm. We not only provide our customers with top-quality products and accessories; we also offer education for experienced users and those curious about the benefits of medical and recreational marijuana. Bridge City Collective works with local labs to rigorously test our products to ensure safety and consistency. We work closely with local businesses that use locally sourced ingredients. Edible products come in a variety of flavors such as coconut capsules, butter, and cookies. Our candies include truffles and peppermint patties, among others. Oils may be used for joint pain, muscle stiffness, and skin problems like eczema and psoriasis. There are no preservatives or artificial scents in our oils. Users will experience little to no psychoactive effects. Like our edibles, our oils are carefully processed and extensively tested for safety and consistency. We’re proud to carry cannabis oils that are commonly used, either topically or orally, to combat a variety of ailments. Bridge City Collective is proudest of our local strains, carefully developed over the past several decades. We carry Dog Walker OG, a hybrid of indica and sativa most commonly used for relaxation and stress relief, that was developed right here in Oregon, as well as several rare and boutique strains. Each has various uses, such as combatting pain, improving sleep, elevating mood, promoting migraine relief, and reducing anxiety. 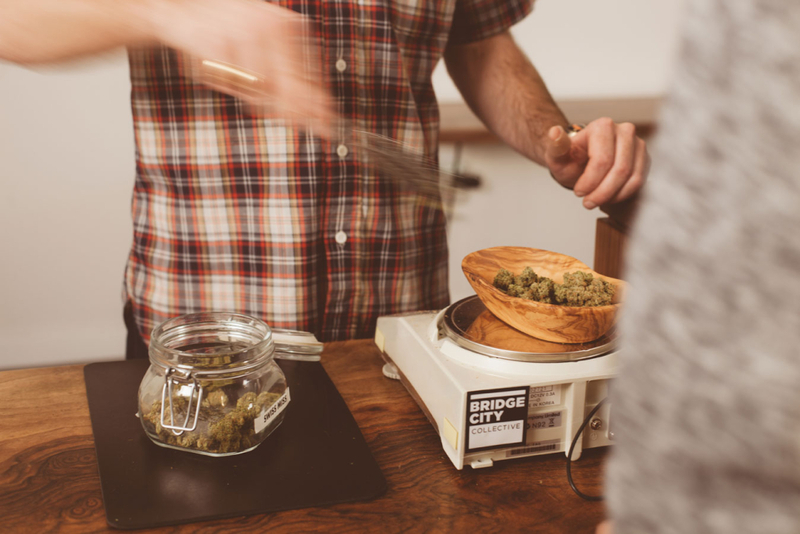 Bridge City Collective’s North Portland dispensary is conveniently located on vibrant N. Williams Avenue, near the Alberta Arts District and Mississippi neighborhood. High quality, rigorously tested, exceptional choices.